On August 18th 2016 was inaugurated The Grande Rota das Flores, that with the opening of the East trails connects to the existing ones along the West coast. 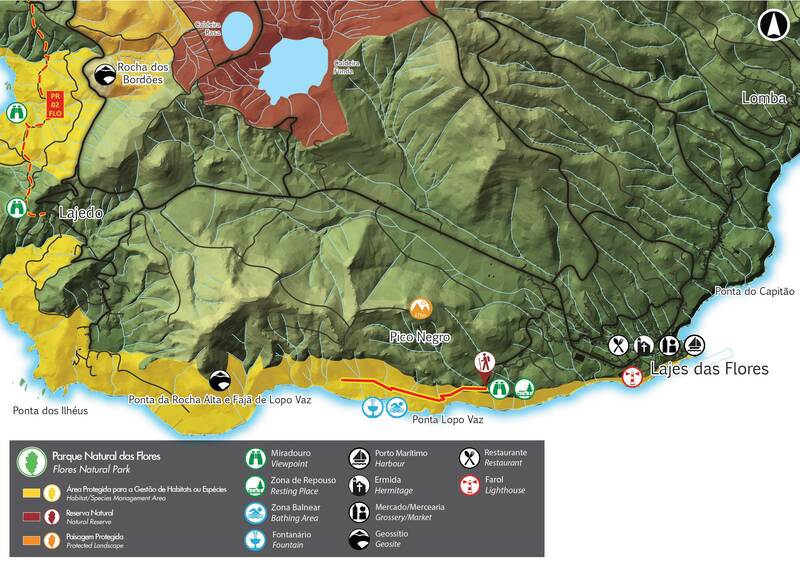 It starts in Santa Cruz das Flores (East area) through the North/North-West until Ponta Delgada (stage 1 – route of 21Km) a new path to discover. 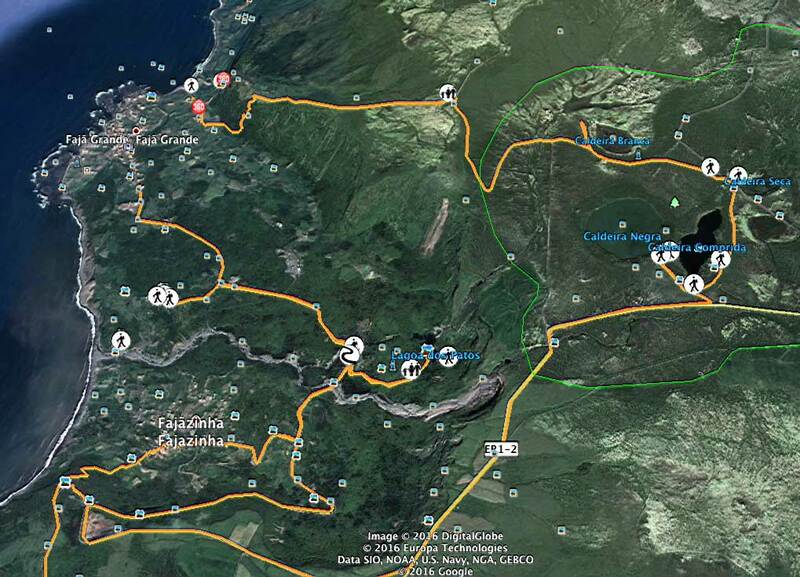 Then continues South (stage 2 – route of 26Km) thru Fajã Grande, and ends in Lajedo (Southwest) on a total of 47 km length. There are sections where the stone ground may be slippery, being advisable caution and the wear of proper footwear. The fall of rocks and stones in some paths is not totally incomun, which leads us to advise you not to listen to any music while hicking. This route might be divided in two stages: the first one with around 21km, with a high level of dificulty mainly due to the topography of the land, that drives you constantly between mountains, deep valleys, and high cliffs; the second with an extent of around 25km also offers an high level of dificulty, conducing you inicially through altitudes of 400m, but without the dramatic ups and downs of the first stage, presenting on the other hand some paths that might cause vertigo. This leg begins on the North part of the airport runway. With Corvo on the horizon go left, along the road, until the high area of Beija Mão (above 300m) where it is possible to profit from a view over the villages below. From here the path goes down, passing by the Recreational Forest Reserve of Luís Paulo Camacho and further ahead, the Hydroelectric Power Plant. 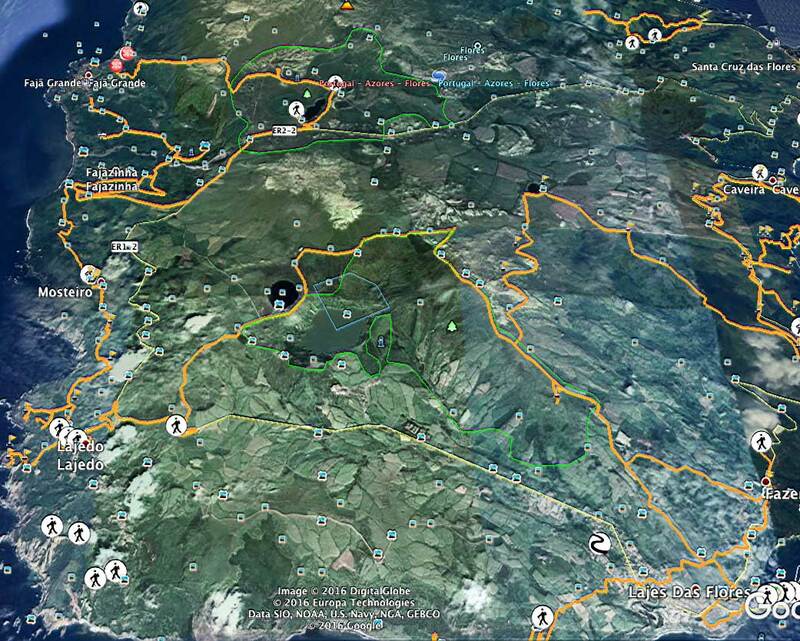 Cross the dam and continue parallel a levada (irrigation channel) by a land road, direction sea. Arriving the regional road follow the markings, with the village of Fazenda on your right, towards the Baia de Alagoa. At this point you find yourself at the sea level already inside a deep valey, continue by a land road on your right, crossing a picnic area with a view over the islets and follow near the coast heading Cedros. Now continue going up the steep cliff to an altitude above 300m, cross this small district, and walk down a little towards Ponta Ruiva, Northeast of the island. From here, the walk continues to Ponta Delgada along the coast, going up and down between several places of great natural beauty such as Ponta das Barrosas where there are remains of an old settlement, Cabouco and Pico do Meio Dia. Along this road it is possible to enjoy several examples of endemic flora such as Azorean Heather (Erica azorica), White Wood (Picconia azorica) and Azorean Holly (Ilex azorica). Descend now to the little coastal village of Ponta Delgada, pass by the Chapel of Nossa Senhora da Guia and end the section at the center of the village, near the Casa do Povo. Begin the stage near the Casa do Povo with Corvo island on the horizon. Along the trail, whenever necessary to cross a gate, always leave it closed. There are some parts where the stone ground may be slippery and after heavy rainy days the riversides water flow increases, being advisable caution and the wear of proper footwear. Follow the road among pastures and agricultural fields until the road turns South. At this point there is a detour on the right, to the lighthouse of Ponta de Albernaz. After visiting the lighthouse proceed South. Approximately with the islet of Maria da Vaz on your right, leave the tarmac and follow the land/cement road ahead through the trail PR 01 FLO. Go down Rocha do Risco – attention for the danger of vertigo – along a forest area with big Azores Juniper (Juniperus brevifolia) until Ponta da Fajã. Follow the marks passing by the detour to Poço do Bacalhau, place with connection to other points of the island through the trail PR 03 FLO – Miradouro das Lagoas/Poço do Bacalhau and go on until the center of Fajã Grande, where it is possible to stop for a dive. Follow the markings near the cliff base by a land road and arriving to the main road, you will find a detour on your left to Lagoa dos Patos, island’s touristic attraction. After the detour through the trail PR 02 FLO, return by the same road, pass a watermill and continue right by a land road parallel to the stream until you reach Fajãzinha. Cross the village, go up the slop and continue along the road passing by places once inhabited such as Caldeira, until you arrive to the village of Mosteiro. Following South you will find, on your right, a viewpoint from where you can see the seashore and also Rocha dos Bordões, a geological formation known by its huge vertical basaltic columns. From here the trail proceeds South until Lajedo, pass by the viewpoint and continue until the center of the village, where the trail ends. 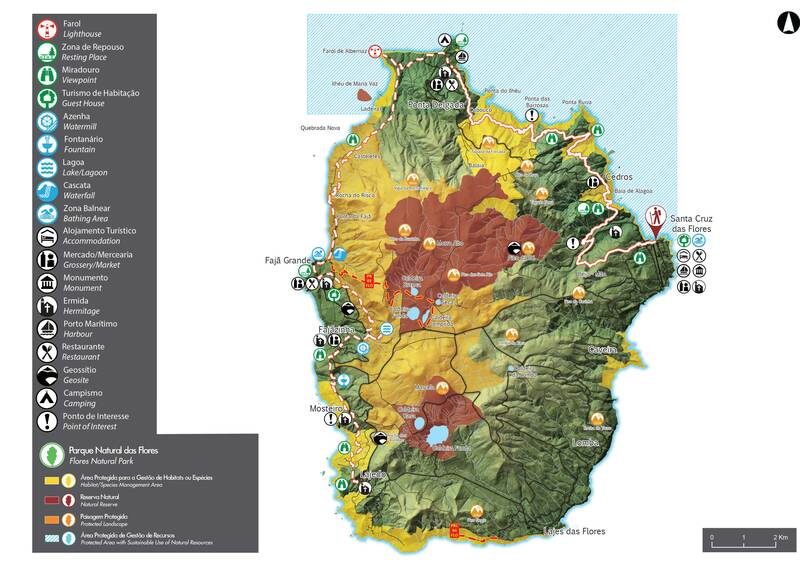 Resident in Fajã Grande could also comfortably take a transfer to PR 01 FLO or PR 02 FLO or Grande Rota ending their walk at home, at Fajã Grande. South next to Lajes starts the trail PR 04 FLO, at the Punta de Lopo Vaz Viewpoint and continues along a single route to Fajã de Lopo Vaz. Start by going down a stone stairway which is flanked by endemic vegetation such as Azores heathers (Erica azorica), fire trees (Morella faya) and white wood (Picconia azorica). 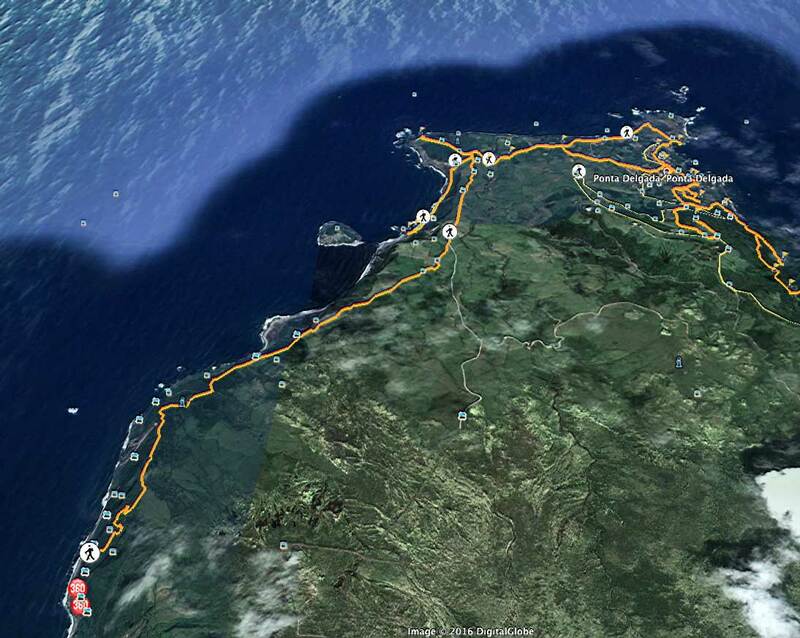 After 1.25km, near the first house, you will see a black sand beach on the left. Take the path on the right and pass by the remaining houses of the fajã (strip of land by the sea), until you near private property which overlooks Ponta da Rocha Alta. At this point, retrace your steps back to the Fajã Viewpoint. Ready for hiking? Check out our accommodations. We drop our clients with or without a licensed wilderness guide, where they choose to start (Santa Cruz, Ponta Delgada or Lajedo) so when they’ll arrive they’ll be home! Unfortunately we don’t use the phone so please write here your needs to have a fast answer. Thank you.